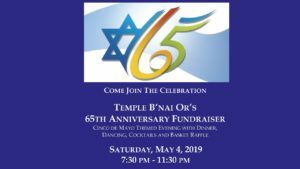 TBO’s 65th Anniversary Fundraiser Join us for our special celebration! Our Cinco de Mayo themed evening is set for Saturday, May 4, 7:30 – 11:30 PM. We hope you will be able to join us! Click here to purchase tickets for this wonderful event! All are welcome! This entry was posted in Announcements on March 25, 2019 by Kim Lefferts.